Hakim Abdi is a researcher at Lund University in southern Sweden. The link between climate change and violent conflict is a complex one. In specific circumstances changing weather patterns may lead to conflict. For example, people may be forced to leave their homes or grazing land and encroach on other communities. But the links are often exaggerated and oversimplified. Somalia is a case of subtle connections between drought, food insecurity and conflict. Understanding these connections better – and identifying other relevant factors – could help prevent suffering in future. The people of Somalia have been through regular cycles of violence and food insecurity in the last few decades. Since the collapse of the central government in 1991, there have been at least seven periods of food insecurity that coincided with droughts. Some were times of famine, which the UN defines according to certain measures of hunger, malnutrition and death, and others were food crises, when hunger and malnutrition rose sharply. The major events were: a famine in 1991–92, food crises in 1999–2000, 2006 and 2008, another famine in 2011–12, a food crisis in 2014 and a food crisis verging on famine in 2016–17. At the same time, the country has been in a state of civil war. Conflict in Somalia has deep political roots that go back decades. After the Somali-Ethiopian war in 1977-78 drained the government’s coffers, severe austerity was implemented to control debts and protests were met with brutal repression. Eventually, the Siad Barre government, which had been in power since October 1969, collapsed in January 1991, ushering in civil war between rival clan-based political factions. The seasons and livelihoods in Somalia revolve around rainfall. The main rainy season (called gu) is from April to June and a second rainy season (called deyr) is from October to November. All other months are dry. Crop prices follow a seasonal trend: they decrease in July/August as the gu harvest replenishes stocks, increase between September and December as market stocks are used up, and decrease again in January/February with the deyr harvest. The rains are particularly crucial to the Somalis whose livelihoods depend on the land. In the pastoral zones, lush pasture nourishes livestock, thus increasing their value. In the agricultural zones, a good harvest lowers crop prices, replenishes household stocks and provides work. Drought has a severe impact. In 2016, poor gu rains led to a low harvest. Later that year, the deyr rains were also poor and the harvest fell by 70%. In the northern parts of Somalia the dry season was hotter and drier than usual, and the region had experienced drought during the previous two years. This destroyed the harvest and livestock. In southern Somalia, 2017 began with a dry season that was hotter and drier than usual. The 2017 gu rains started late and were below normal, which led to a low harvest. The combined effects of these events were that people could not feed themselves or get work. The UN Office for the Coordination of Humanitarian Affairs estimates that over 3.1 million people are in need of urgent humanitarian assistance. 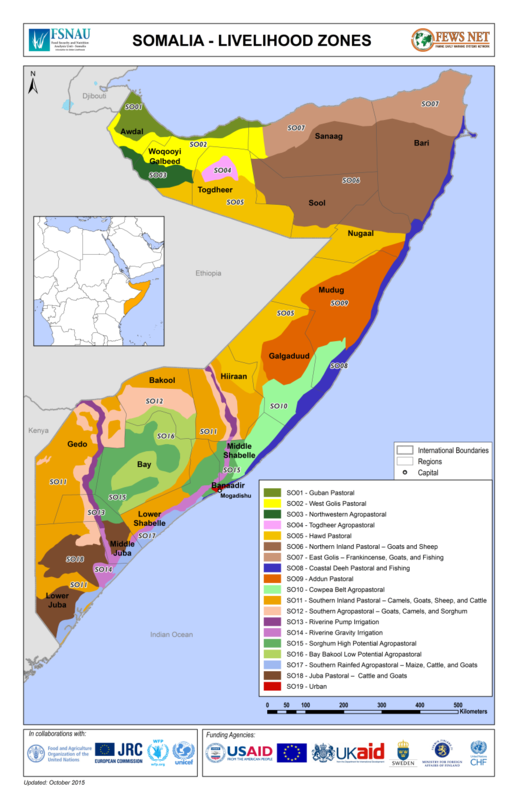 In southern Somalia, the militant group al-Shabaab controls large areas including key agricultural areas. The group relies on a variety of tactics to get new recruits and solidify its presence. For example, in one area it builds canals to make local farmers less dependent on rainfall, thus cultivating goodwill and getting recruits. Because of the increase in food prices, [the famine] has been a boon for al-Shabaab’s recruitment campaign because when you don’t have purchasing power to buy the food, you will be encouraged to be recruited because then you will be saved, and you can use that salary or you could be given food. In other words, al-Shabaab takes advantage of the hunger and desperation caused by drought. In this way, climate worsens the conflict by giving al-Shabaab more manpower. It is wrong to blame climate change for famine and conflict. These can either be prevented, or the impact minimised, if institutions and mechanisms of good governance are in place. For example, the severe 1973–75 drought in Somalia affected 700,000 people (20% of the population) and the death toll was around 20,000 (less than 1%). The country at the time had a strong central government and institutions that dealt effectively with the natural disaster and reduced its impact. International help was also sought quickly. Around USD$ 640 million (2017 equivalent) was spent on drought relief efforts. promptly and effectively mobilised all resources at its disposal to cope with the emergency. Somalia’s new president, Mohamed Farmaajo has already declared the current drought a national disaster, and the country is in the process of formulating its first national disaster management policy. For this policy to be effective, Somalia needs a Somali-led integrated disaster information system that identifies food insecurity and directs response. Other useful steps include harnessing local knowledge and technology to meet the people’s needs. According to a recent study, there has been a strong link between global warming and increased dryness in the Horn of Africa over the past 2000 years. Somalis should be prepared for more hard times in future.